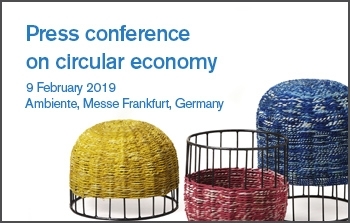 WFTO will profile the efforts of members to pioneer upcycling and circular economy production models through a press conference at Ambiente. The press conference will take place on 9 February at 14:45 (Dimension room at hall 4.2) and will be followed by a session for individual WFTO members to meet with journalists to get increased visibility for the innovative efforts. Dubbed a 'speed dating' session, WFTO members listed in Ambiente’s Ethical Style Guide will present their most innovative products for three (3) minutes and two (2) minutes to ask questions. Contact us for details.